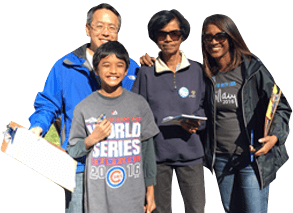 The Asian American Action Fund is a political action committee that seeks to increase the Asian American and Pacific Islander community’s voice in politics at every level of government across the United States. The AAA-Fund is a progressive political organization that is dedicated to empowering Asian Americans and Pacific Islanders across the United States. Through the AAA-Fund, Asian American Pacific Islanders from different ethnic groups and from all over the country work together to increase the voice of the AAPI community in local, state, and federal government. We do this by helping to elect political candidates who have a demonstrated commitment to the community and by engaging AAPIs in the political process. Since our founding in 2000, we have endorsed more than 200 candidates from every AAPI ethnic community, in every region of the country, and at every level of government. Together, we are building a national network of AAA-Fund chapters, leaders, and activists that are increasing the AAPI community’s voice.